In a bid to harness the power from gallons of high pressured water that flows through a city's water system every day, more and more local governments are exploring the possibility of in-pipe hydropower technology. Frank Zammataro, President of in-pipe hydropower company Rentricity, talks about the long-term potential of this burgeoning industry, its current challenges and cost-effectiveness. By Heidi Vella. Zammataro says this is a: "Dual Flow-to-Wire installation running one turbine, the other or both depending upon the changes in flow into the treatment plant. The plant may be the first "energy-neutral" water treatment plant powered by its own water intake in the world!" This installation at the Beaver-run pump station for the Municipal Authority of Westmoreland County near Pittsburgh is a 25kW installation that powers two of four large horsepower pumps that send water up hill to a treatment plant 2,500 feet away. Electrical conduit installation completed by the company in July 2005. In every Western urban city, gallons of high pressure water relentlessly shoots and flows around a hidden labyrinth of water pipes, with the key purpose of providing clean water to thousands of homes and buildings. As the system goes through its daily labour, it produces an abundance of useable energy that, if not captured, is simply lost. There is a small but burgeoning movement to harness this power and feed it into the national grid, creating clean, usable, renewable energy that would otherwise be wasted. New York-based Rentricity is a leading company that has created technology to capture this power, which is known as ‘flow to wire’. This includes a reverse pump, a generator and controllers that can be installed at a water treatment plant or underground water system vaults that provide water to neighbourhoods. The technology harnesses this highly pressured water, which typically goes through underground water utility substations, where its flow and pressure is reduced, in preparation to enter the smaller pipes of homes and businesses. The energy is then sold directly to the grid. "Rentricity is a leading company that has created technology to capture this power, which is known as ‘flow to wire’." Although not an entirely new concept – in 1985 Boulder in Colorado installed eight small scale hydroelectric generators in its municipal water system, which provides roughly 11% of the city’s electricity – its popularity is fast growing. Last year, Scottish Water invested £20m in-putting in-pipe hydro in its water systems, at the beginning of this year Hong Kong announced it will install in-pipe hydro to its 7,880km of water pipes and around the same time New York City’s Department of Environmental Protection (DEP) said it was collecting proposals from consultants interested in assessing the hydroelectric potential of the city’s water systems. To find out more about this growing hydropower trend, Power-technology.com spoke to co-founder and president of Rentricity, Frank Zammataro, about the potential of in-pipe hydro, its constraints and cost-effectiveness. Heidi Vella: Please give an example of one of Rentricity’s projects? Frank Zammataro: One of our installations is in Keene, New Hampshire, where they were moving approximately three million gallons of water to serve a population of about 20,000. "What we created there is the very first energy neutral water treatment plant, powered by its own in-flow of water." They were interested in the raw water intake in their water treatment plant and whether or not they could recover energy from it. In essence, what we did is install two turbines to handle high and low flow coming in from this water plant and then we moved all that power to the public service of Hampshire, or the electric grid. What we created there is the very first energy neutral water treatment plant, powered by its own in-flow of water. We have had three commercial installations to date and Rentrictiy is connecting four units this year, two in Pennsylvania and two more in New Hampshire. In 2013 we will be installing installations in California, Vermont and Canada. 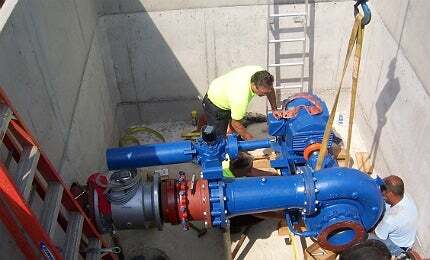 HV: What challenges and constraints must be considered when installing in-pipe hydro such as this? FZ: When considering hydraulics and pressure, you have to understand that when this technology is installed it is installed in a transparent manner. Meaning, if for whatever reason, your technology has to be taken offline, the system could go back to the normal processes it already had in place. So a transparent installation is important. Also, understanding the hydraulics and understanding any pressure surges in the system is very important, so that pipelines aren’t damaged. So, the two major challenges are a transparent installation and pressure management. HV: Where is in-pipe hydro best utilised? FZ: It requires a minimum of 250 gallons a day of consistent water flow, so you’re not going to find that in a building, but you might find it in an industrial process plant. So for example, a pharmaceutical programme might use 5,000,000 gallons of water a day, so they might be able to cover and offset their electricity costs. Therefore, it would be manufacturers, or municipal governments serving a big population of people on a consistent basis. HV: How cost effective is pipe-line hydro? FZ: These technologies get installed on average in the US at between four cents and six cents a kilowatt hour. The average wholesale cost of electricity for most municipal governments in the US is about nine cents a kilowatt hour; therefore, there is an economic value to make an investment in the technology. Most can pay back their investment in a five to seven year time frame and enjoy a 30 – 40 year lifespan of the machine. So, in our project in New Hampshire, in the life time of the installation they will save a little over $1m offsetting electricity costs. HV: What kind of maintenance do installations require? FZ: There is a minimum maintenance on a year to year basis and then a ten year overhaul of the system. HV: The trend for in-pipe hydro is growing, in the future could it be considered as standard for large scale water systems? "Most can pay back their investment in a five to seven year time frame and enjoy a 30 – 40 year lifespan of the machine." FZ: That depends on two main factors: the price of electricity, as the electricity cost continues to go up there will be a need for alternative forms of energy. So in-pipe hydro will be one of many things, along with other renewables, such as solar and wind, that will be in the mix. We do believe there will be growth. The other factor will be build-out or the enhancement of water infrastructure. We believe a lot of the water infrastructure in developing countries is old and will be required to change. When they make these changes, we want to ensure that any pipeline project will include in-pipe hydro as part of the installation, so they are being as energy efficient and sustainable as possible. So the two main factors for growth for a company like Rentricity is the increase in electricity to municipal governments and manufacturers, and also the rebuilding of pipeline infrastructure. HV: Does Rentricity have plans to explore the international market? FZ: Right now the company is focusing on North America. We have received some enquiries from Europe and South America but we don’t move on them unless they are a definitive opportunity, as we just don’t have the resources, as we’re a small company. In Europe, with electricity costs being so high, much higher there than in the US, we definitely think this is something European countries should be considering. For countries like Germany, for example, who are eliminating nuclear, this would be a nice add on to their activities. Google’s $200m equity stake in the Spinning Spur Wind Project in Texas, US, brings the company’s total committed investment in renewable energy to more than $1bn. US shale gas: game changer, or game over? Shale gas is on the rise in the US, projected to account for 46% of the country’s gas output by 2035.